In fact, if it is hard for you to picture it, the tonnes of garbage piling up in and around our capital city are a perfect way to physically depict what corruption, mismanagement, monopoly, nepotism, patronage, clientelism and misuse of public funds does to a country: it is toxic, it affects everybody and may eventually kill everybody, just like the garbage will, the longer it stays on our streets. 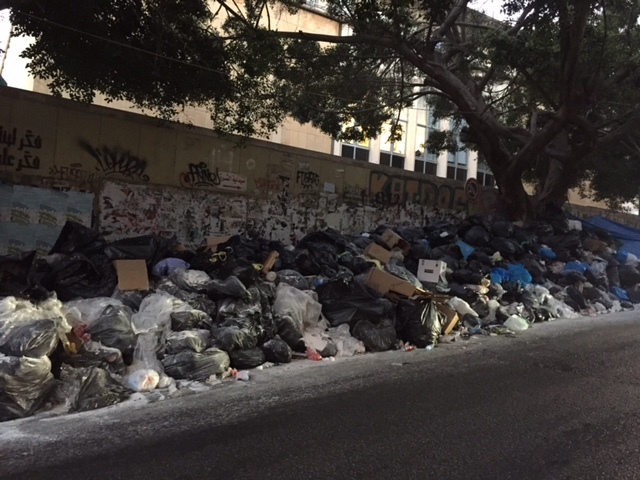 Trash piling up on the streets of Beirut’s Hamra district, for almost two weeks, on the wall of the American University of Beirut’s Medical Center complex. Credit: Marina Chamma. Like almost every one of our national disasters (water shortages, electricity shortages, absence of public transportation, expensive and poor internet and communication services, a ballooning public debt, and the list goes on…), the garbage crisis is both a technical issue and a political issue. The technical side of the story is simple: a government too busy doing nothing that has been unable/unwilling to find an alternative landfill for Beirut/Mount Lebanon and a environmentally friendly method to deal with our waste. 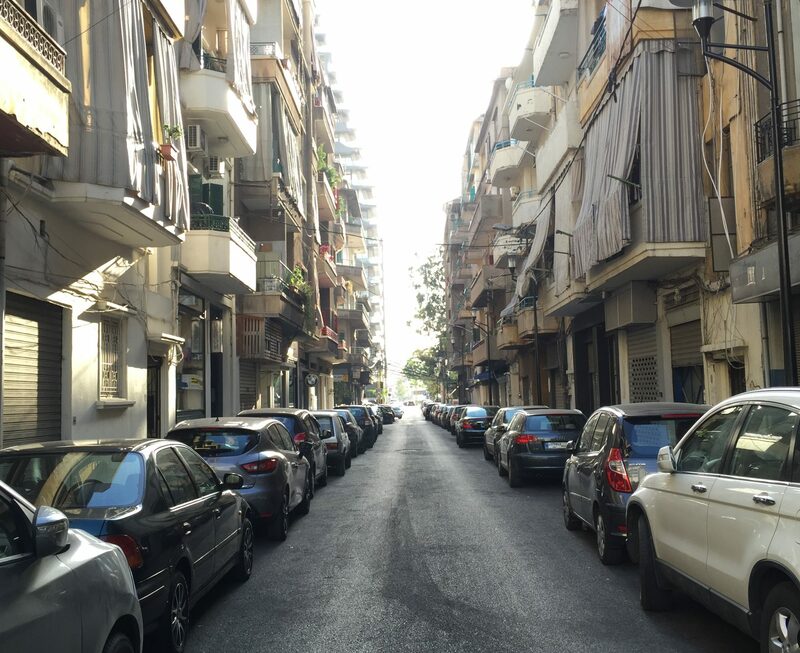 The political side of the story is a bit more complex, but mainly involves preserving the decades-long monopoly of Sukleen (backed by the Hariri family) with its non-transparent contract with the government and unjustifiably expensive rates to handle waste. Never too far away from controversy, Walid Jumblatt, whose political sphere of influence covers Naameh, the location of the now-closed landfill, may also be trying to make political and financial gains from the crisis and a possible solution to it. Currently joking on Twitter on the need to establish Christian and Muslim landfills and the difficulties of sorting Christian garbage from Muslim garbage (as different regions refuse to be locations for alternative landfills, presumably for the garbage of other regions, and hence, other confessions), Jumblatt has denied involvement in a potential waste management solution, which has apparently failed for unknown (perhaps not enough financial compensation) reasons…but who knows? Today, it is these two parties involved, but tomorrow, with another life and death issue, it will be someone else, names don’t matter, they are all the same. The fact that the people will pay the price will always remain the same too. When it comes to Lebanese politicians and their interests, nobody loses, except if he or she is dead. I have no faith in the way the current garbage crisis will be resolved. No sustainable solutions will be supported by the government (because this would serve the political and financial interests of the people), although many conscientious environmental activists have provided environmentally friendly and cost-efficient solutions to decision makers time and again. Any solution will keep the political and financial interests of politicians and politically backed individuals as a top priority. The sad reality is that no matter who and how many times those responsible for this disaster get named and shamed, whether the cabinet, council of ministers, minister of interior, minister of environment or individual politicians, nobody will be held accountable and nobody will pay the price. The garbage crisis will be resolved sooner or later, but it will always be at the expense of the citizens, always. My greatest joy would be if I’m proven wrong. I do not blame citizens for not taking to the street to protest this latest disaster. Apathy and extreme disappointment at the way every other crisis has been handled in the past is as toxic as garbage, and has infected many of those who once believed raising their voices and slogans on the streets could make a difference, but in fact never has. But I salute those who have, not surprised at all, that some (most notably Tarek Al Mallah and Firas Bou Zeineddine. Update: both have been released.) have already been detained for expressing their anger at this situation, which doesn’t even trample upon their political or social rights, but their basic human rights, that of living in a decent and clean environment to ensure a basic standard of living. There are those who have criticized some of the slogans that have been shouted at the government from Riad Al Solh Square, such as those calling for the downfall of the regime. To those who think this is beyond the point I say, this is exactly the point. The garbage crisis is about the regime and nothing but the corrupt and failing regime, which is best exemplified by a trash can, whose corruption has been pilling up as garbage bags are for years. Solving the current crisis will remove some of the garbage bags piling up over the can, but there are tonnes of other bags before it. If a country and its government cannot provide the minimum of a decent existence to its people, then it has failed, terribly failed. It no longer becomes a failed state, but an utter state of failure. This is our Republic of Trash.